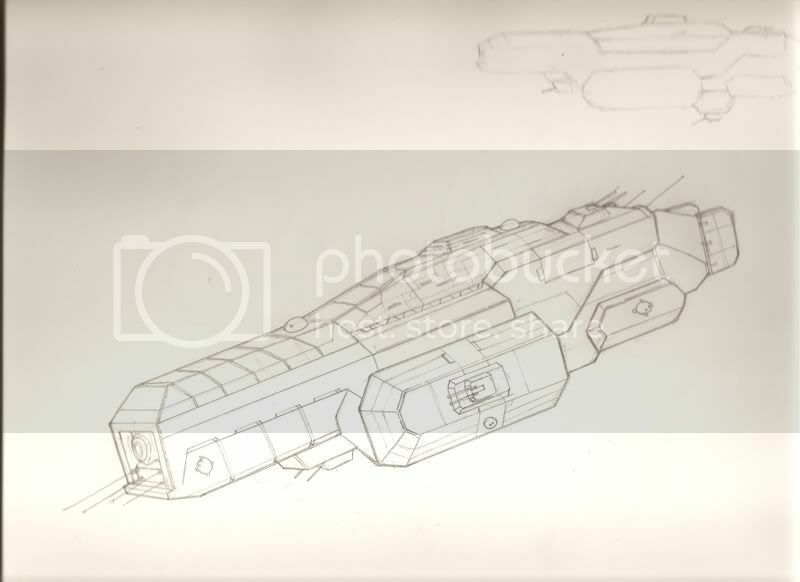 Thought I'd try my hand at drawing a space battlecruiser. I was using B5 and homeworld as my primary inspiration. Now that's really nice! The straight lines are awesomeng. Shroom Man 777 wrote: Now that's really nice! The straight lines are awesomeng. Thanks, I used a ruler! It's nice. Looks like.. you followed the Homeworld game art style? Fingolfin_Noldor wrote: It's nice. Looks like.. you followed the Homeworld game art style? Yes, I am a big fan of Homeworld's art style, especially the taiidan heavy cruiser. I'm also partial to B5 and a few others. It's good to see you branching out to something new, though it was also nice to see one of your robots again. 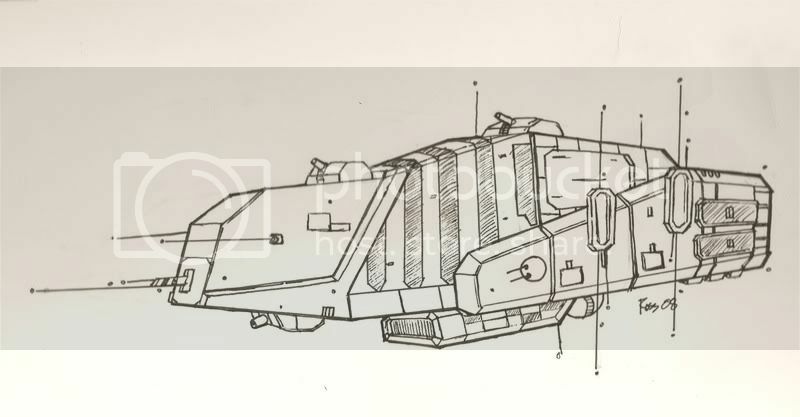 Another ship, blatantly rippe... err inspired by Homeworld! Hmmm... You should never cover a face like that. Even on Diver Man. havokeff wrote: Hmmm... You should never cover a face like that. Even on Diver Man. Next time the guns will be lower...just you wait! But seriously, thanks for the input! 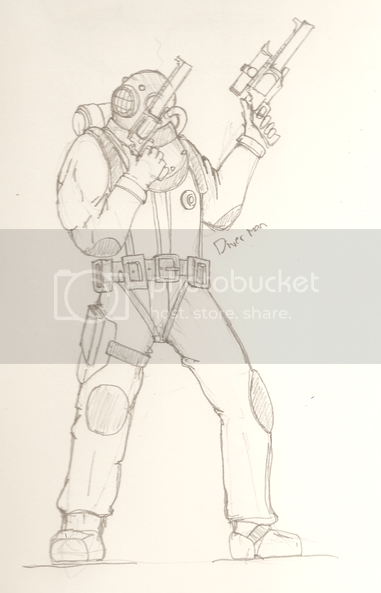 Yes, we must have a superior rendition of Diver Man! That's awesome! Brass Diving Helmets, I love those! And Revolver Pistols! Now we're talkin'! Looks real good and the action pose is worthy of a G.I. Joe card file. Sadly, I am coming to realize that the pencil artists on SDN are all suffering from the same disease though... Nobackgrounditis. I know I need to work on that. Edit: We need to get you a better Destro AV... too small! Destro would have none of that. havokeff wrote: Now we're talkin'! Looks real good and the action pose is worthy of a G.I. Joe card file. I think Destro can make his own choices about whether big or small is good or bad....My....DEAR...........Havokeff. You should emphasize his diving helmet some more! Feel kind of silly commenting on a month old drawing, but the perspective is broken in the spaceship in the first post on this page. Parallel lines should be parallel or, if not parallel, should all point to the vanishing point. Your parallel lines point away from each other, giving the impression of the ship being twisted around its longitudinal axis. Do you have a T-square and triangle? 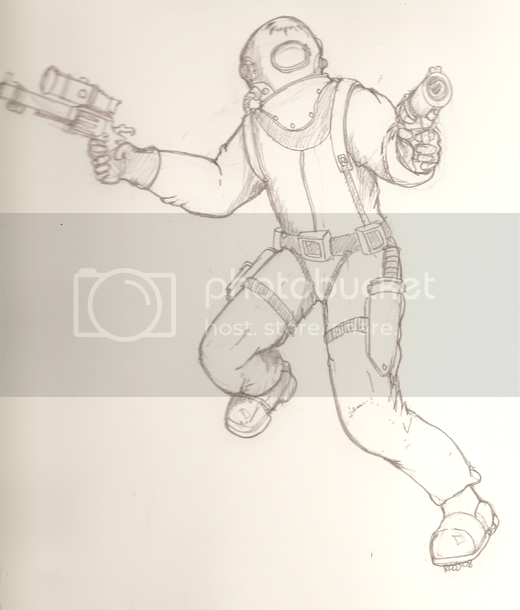 Feil wrote: Feel kind of silly commenting on a month old drawing, but the perspective is broken in the spaceship in the first post on this page. Parallel lines should be parallel or, if not parallel, should all point to the vanishing point. Your parallel lines point away from each other, giving the impression of the ship being twisted around its longitudinal axis. Do you have a T-square and triangle? I have a t-square now, but not when I drew the ship and I still lack a triangle.. Time for more practice! 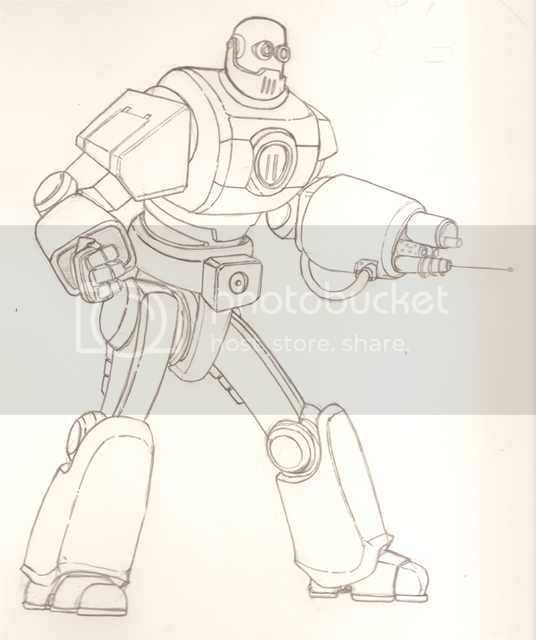 I was inspired by iron giant and liberty prime. Oh yeah. Right on! Love the design on that one. Good action pose too! You are getting much better. 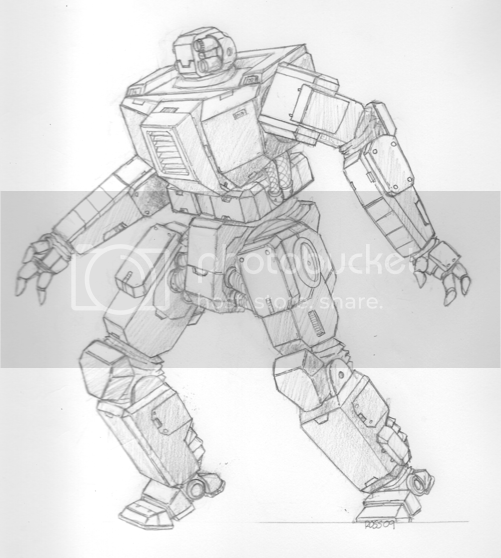 A mech sketch. 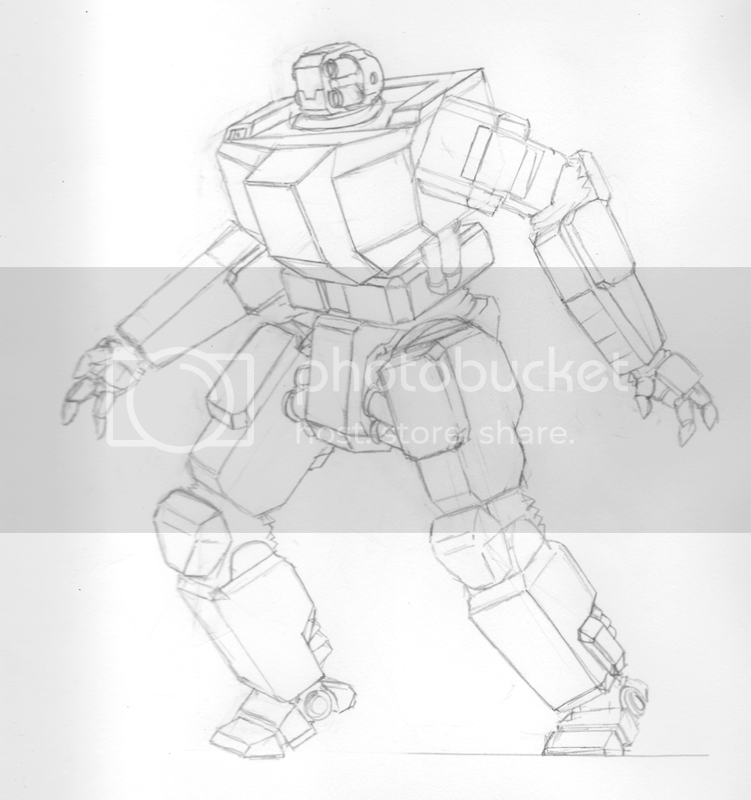 I wanted to draw some mechs, but college is eating up my time along with my artists block, so everything I've tried looks similar to what I've done before. This is the only thing I've drawn in a while so I thought I'd throw it up here. Man, we need to get you branching out your horizons, to get some new aesthetics into you. Ford is absolutely correct. Try drawing something else, Muffin. Like minigun-tusked elephants smoking copious amounts of tobacco or something. Try drawing a T-800 Terminator or something. Thanks guys for your input! Playing Fallout 3 has given me some ideas, and Shroomy never ceases to be a wellspring of inspiration!